Get ready to admire Steve Bannon even more than you already do: Last night the former White House chief strategist dreamt of a gun, and now he’s journeying deep into the desert to find it. Wow, now this is courage personified. It seems like Bannon took that message to heart, because after awakening he immediately filled a Nalgene bottle with a 50-50 mixture of blue Gatorade and milk that’ll keep him both hydrated and nourished while traversing the harsh desert environment. 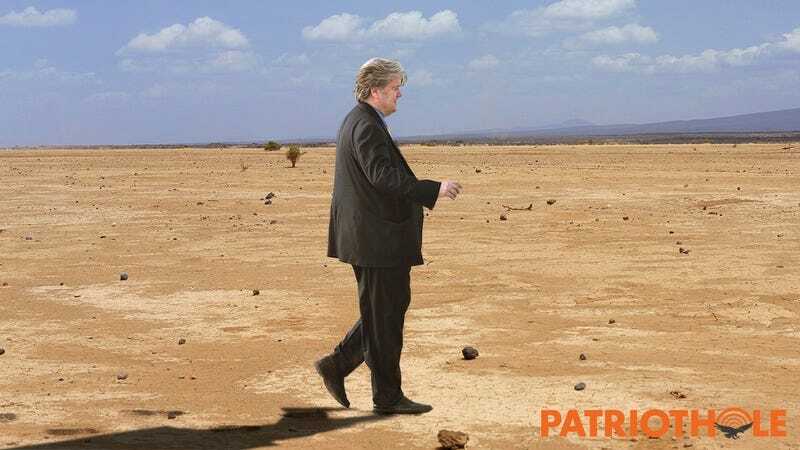 He’ll have to carefully conserve this life-giving drink, because Bannon must tread untold miles across the desolate sands before he finds the gun’s hidden location. Once Bannon recovers the gun, the incredible hero plans to take it to a firing range and shoot paper cutouts shaped like muggers. Let us pray that Bannon finds the gun swiftly and safely, so he can return to the White House and let President Trump and the rest of the senior staff touch it. Good luck in the desert, Mr. Bannon. Our hopes go with you.